This game was completed in 48 hours for Ludum Dare 29. All high-level scripting, graphics and audio was created by myself during this time. The theme was "Beneath The Surface". Here is a link to the submission page. 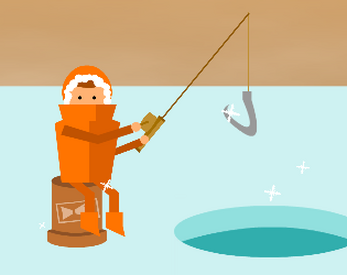 Explore the quirky depths of the ocean with your trusty ice-fishing rod. But beware, something sinister is happening... beneath the ice. Drop the line by scrolling down and reel in by scrolling up. If you do not have a scroll-wheel you may use the arrow keys but that was not the intended control scheme. Upgrade your fishing rod by clicking the icons in the top left corner of the screen.